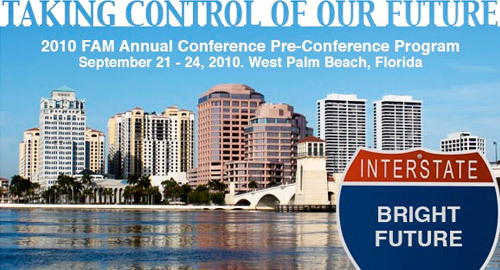 West Palm Beach provided the setting for the 2010 FAM Conference. MDG Advertising attended the four-day event, which kicked off with more than 250 participants from over 100 museums across the state. It is the largest cultural conference in Florida and FAM is one of the largest state museum associations in the U.S.
“The Marriott West Palm Beach, the Chamber of Commerce of the Palm Beaches, and the Palm Beach Convention & Visitors Bureau rolled out the red carpet for us,” said Malinda J. Horton, executive director of the Florida Association of Museums. This year’s conference theme was “Taking Control of Our Future.” The conference provided an opportunity for the cultural community to have a dialogue about the many ways in which museums can proactively move forward in this economic climate. One hundred sixteen speakers, from a variety of local, state and national cultural organizations presented at the conference on a wide range of issues. When Russell Daws, executive director and CEO of the Tallahassee Museum was asked what he considered to be the best part of the conference, he replied, “Getting together with amazing, smart, passionate people.” And that truly was the sentiment during this extraordinary event. With the cultural community at risk in these trying times, it was an exceptional experience to participate in. MDG Advertising specializes in creative advertising, interactive marketing, collateral design, transit advertising, SEM/SEO, social media, public relations and media buying for museums and non-profit institutions. Hilarie Viener is director of communication and strategic initiatives at MDG Advertising in Boca Raton, Florida. MDG Advertising is a full-service advertising agency, with offices in Florida and New York, that specializes in developing targeted internet solutions, exceptional creative executions, and solid branding and media buying strategies that give non-profit clients an advantage. For more information, call 561-338-7797 or log on to mdgadvertising.com.